Cd is a toxic metal, whilst Zn is an essential for plant and human health. Both can accumulate in potato tubers. We examine the genetic control of this process. The aim of this study was to map quantitative trait loci (QTLs) influencing tuber concentrations of cadmium (Cd) and zinc (Zn). 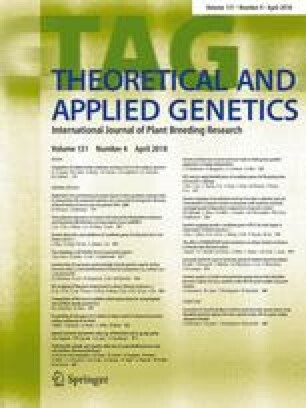 We developed a segregating population comprising 188 F1 progeny derived from crossing two tetraploid cultivars exhibiting divergent tuber-Cd-accumulation phenotypes. These progeny were genotyped using the SolCap 8303 SNP array, and evaluated for Cd, Zn, and maturity-related traits. Linkage and QTL mapping were performed using TetraploidSNPMap software, which incorporates all allele dosage information. The final genetic map comprised 3755 SNP markers with average marker density of 2.94 per cM. Tuber-Cd and Zn concentrations were measured in the segregating population over 2 years. QTL mapping identified four loci for tuber-Cd concentration on chromosomes 3, 5, 6, and 7, which explained genetic variance ranging from 5 to 33%, and five loci for tuber-Zn concentration on chromosome 1, 3, 5, and, 6 explaining from 5 to 38% of genetic variance. Among the QTL identified for tuber-Cd concentration, three loci coincided with tuber-Zn concentration. The largest effect QTL for both tuber-Cd and Zn concentration coincided with the maturity locus on chromosome 5 where earliness was associated with increased tuber concentration of both metals. Coincident minor-effect QTL for Cd and Zn sharing the same direction of effect was also found on chromosomes 3 and 6, and these were unrelated to maturity The results indicate partially overlapping genetic control of tuber-Cd and Zn concentration in the cross, involving both maturity-related and non-maturity-related mechanisms. Communicated by Herman J. van Eck. The online version of this article ( https://doi.org/10.1007/s00122-017-3048-4) contains supplementary material, which is available to authorized users. The work is funded by a Ph.D. fellowship under the Department of Agriculture, Food and the Marine FIRM/RSF/CoFoRD scheme (Project ref. no. 11SF308). We would like to extend our appreciation to Dr. Christine Hackett, Biomathematics and Statistics Scotland, for providing early access to TetraploidSNPMap, and for much useful discussion and guidance on its use. We also appreciate the assistance of the potato breeding team at Oak Park Crop Research Centre in Carlow for assisting with field maintenance of the population and pot trials, and Francis Collier at Grange Animal and Grassland Research Centre in Dunsany for assisting in soil collection for the experiment.